Boulders Beach lies on the outskirts of Simon's Town, a southern suburb of Cape Town. Part of Table Mountain National Park, this breathtakingly beautiful nature area boasts fine white sand and sapphire waters. 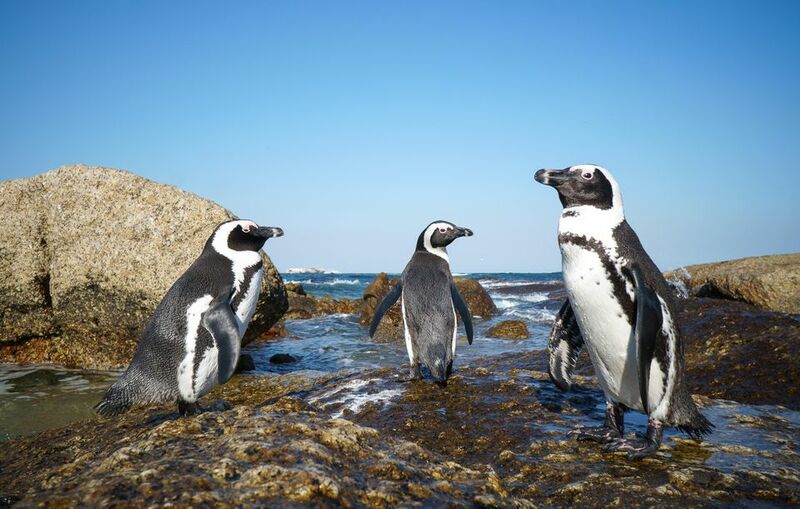 It's also home to one of the world's only land-based African penguin colonies. These endangered birds are native to South Africa and Namibia and are loved by locals and tourists alike for their charismatic nature, diminutive size and smart black-and-white plumage. At Boulders Beach, visitors have the privilege of swimming alongside them in their natural environment. Boulders Beach comprises three beaches, three boardwalks and a penguin viewing area. To gain access to them, you need to pay a conservation fee at the visitors center. The main beach is an idyllic cove with panoramic views across False Bay and ancient granite boulders that protect it from wind, waves and current. It's a sheltered spot for a picnic, and a safe place for swimming. Although the sea is warmer in False Bay than it is off Cape Town's Atlantic Ocean beaches, be prepared for bracing temperatures. The water reaches highs of 70ºF/21ºC in January and gets as cold as 57ºF/14ºC in August. The penguins roam freely throughout the area and are naturally inquisitive, so you're likely to see them inspecting your picnic basket or bobbing beside you in the shallows. For a closer look, wander along the boardwalk that connects the main beach with Foxy Beach. It takes you through the colony and within a few feet of the nest sites. At Foxy Beach, the boardwalk opens out onto a viewing platform that gives you an elevated perspective of the penguins socializing, fishing and playing in the waves. In winter, keep an eye out for migrating humpback and southern right whales in the bay. The Boulders Beach colony was established in 1983 by a single breeding pair. Their success attracted other African penguins from offshore colonies and so the nest site grew. In 2000, penguins throughout the Cape Town area were affected when an iron ore tanker called the MV Treasure sank near Robben Island, releasing 1,300 tons of oil into the ocean. More than 19,000 oiled penguins were rescued and another 19,500 were captured and relocated to the Eastern Cape. More than 91% of the oiled birds were successfully rehabilitated and released back into the wild in what became the largest animal rescue event in history. The Boulders Beach colony reached its peak in 2005, when approximately 3,900 birds were counted there during the height of the breeding season. Sadly, it has declined since then with only 2,100 birds counted in 2011. This is likely due to a decrease in the global African penguin population as a result of habitat destruction, overfishing, global warming and marine pollution. African penguins are now classified as Endangered on the IUCN Red List. Although the penguins are likely to come within touching distance, visitors are not allowed to make contact with them. This is for their safety and yours, as they have sharp beaks and will use them to defend themselves if they feel threatened. Boulders Beach is part of a Marine Protected Area and is a no-take zone. This means that fishing is forbidden, as is the removal of any other sealife including shells. Alcohol and smoking are also prohibited. If you plan on visiting Boulders Beach in the South African winter (June to August), consider hiring a wetsuit so that you can stay longer in the water. In summer, it's advisable to bring sunscreen and plenty of drinking water. Beach space is limited at high tide, so if you want to enjoy a picnic or a spot of sunbathing on the sand, make sure to check the tide tables first. Lastly, the beach can get busy during the festive period. Come early in the morning or late in the afternoon to avoid the crowds and increase your chances of finding a parking space. Daily rates for foreign visitors are R152 per adult and R76 per child. There are discounts for South African citizens and SADC nationals. The Boulders Beach visitor center is located on Klentuin Road, just south of Simon's Town. If you have your own car or plan on renting one, it's an hour's drive from Cape Town's V&A Waterfront without traffic. There's plenty to see on the way, especially if you drive via Chapman's Peak, the magnificent coastal toll road that winds along the cliffs between Hout Bay and Noordhoek. If you don't have access to a car, take a taxi or an Uber from Cape Town, or from the Simon's Town train station. Many Cape Town day tours will stop at Boulders Beach.